PETALING JAYA: The proposed mass rapid transit (MRT) system is expected to be one of the main contributing factors to boost property prices adjacent to the MRT stations. CB Richard Ellis (M) Sdn Bhd executive director Paul Khong said the MRT stations generally had a positive impact on nearby property values in most cases. “Being next to the station works well for lower and middle-end residential neighbourhoods and all commercial offices or retail malls. This basically translates to better public transportation and enhanced accessibility to the relevant vicinities,” he told StarBiz. On the expected quantum capital appreciation due to the MRT stations, Khong said it could be 10% to 15%. “More importantly, the MRT station must be less than a 1O-minute walk from the properties. Ultimately, being next door and within five minutes away will be a premium. But, Khong said, the property prices could be affected if it was alongside the MRT tracks and not the station. “The crucial point is to be close or next to the station if possible,” he said. The RM36bil MRT system proposal by Gamuda Bhd and MMC Corp Bhd will have up to three main lines. The first line will run through Sungai Buloh, Kota Damansara, Kuala Lumpur and Cheras (right up to Kajang). The second line will connect Sungai Buloh, Kepong, Kuala Lumpur and Serdang, while the third line will loop around Kuala Lumpur’s business district – providing a link between the monorail and light rail transit (LRT) services. The Gamuda-MMC proposal is currently undergoing technical study by a consultant and should be completed by mid-month to be presented to the Government. At this point in time, there is no information on the exact locations of the proposed MRT stations. According to property consultancy Khong & Jaafar Sdn Bhd managing director Elvin Fernandez, most of the areas around the LRT stations have been developed and it is axiomatic that accessibility would improve property values. “But the impact wouldn’t be immediate as the MRT will take time to complete and the effect will be evident only from details of the exact positions of the rails and stations filtering into the market in time to come,” he said. Based on preliminary details of the MRT, Fernandez said the Sungai Buloh area (the Guthrie Corridor townships) and the proposed Rubber Research Institute Malaysia developments could be among the first beneficiaries because both lines were expected to start from there. “Kajang and Seri Kembangan are the next areas to flourish as they are on the other end of the line. Additionally, the Cheras corridor also has good prospects,” he said. Nevertheless, Fernandez said, some developments might be negatively affected, especially residential developments, due to the noise or congestion if they were close to the rail lines or stations. “But generally, the MRT should bring positive effects to the nearby areas,” he said. 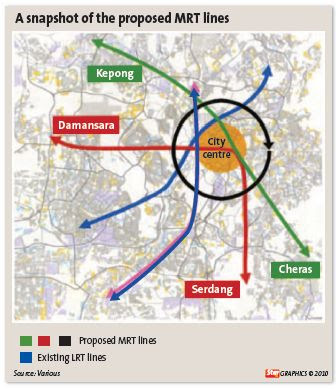 According to a market source, another area that would have potential based on the proposed MRT system was the Kota Damansara corridor. “The Kota Damansara corridor includes Kota Damansara, Mutiara Damansara, Damansara Perdana and The Curve. Business and financial districts along Jalan Raja Chulan, Jalan Bukit Bintang and Suria KLCC also have good prospects,” said the source. UEM Land Holdings Bhd, a Malaysian property developer, aims to grow revenue five-fold to RM2 billion in five years, Credit Suisse Group AG said in a report today, citing company management. UEM Land’s Bandar Nusajaya project will contribute at least 60 per cent of the sales in five years, Amir Hamzah, an analyst at Credit Suisse said in the report. The company is also in talks with several Singaporean government-linked companies on property projects, Amir said. Though Penang lacks natural resources such as oil and gas, it can depend on its human talent to move forward. Chief Minister Lim Guan Eng said the human capital would enable Penang to propel forward in this new century. “We should harness the best and the brightest of our human talent and human capital. I am confident Penang will achieve the target of becoming a world-class international city. “To be an international city, we must have international standards and adopt the best international practices,” he said in his keynote address at the Penang International Property (PIP) Summit 2010 at the Penang International Sports Arena (PISA), Relau recently. He added that Penang had to find its own niche, which were sustainable and green, to become an international city. “More than 70% of the global population will be living in cities by the year 2050. With so many people living in cities, how do we distinguish Penang from the rest? “I think Penang must project itself as an intelligent city for it to find its niche. “Apart from the three traditional aspects of intelligence which are human, collective and digital intelligence, we must also have integrity intelligence and institutional intelligence,” he said. “In short, we are looking for peace and security for the people, equal opportunity for all and democracy so that everyone can realise their potential,” he said. The property summit, organised by PIP Creation Sdn Bhd with support from Raine & Horne International and Penevents Sdn Bhd, showcased properties from 30 exhibitors such as S P Setia, Ivory, DNP, Ideal Homes, Seal Incorporated, Plenitude and MTT. Among the highlights was the three-day trade forum which provided critical awareness of local and regional trends in the property market.